Get the Tools Tim Ferriss & His Tribe of Mentors Use to Supercharge Their Lives! 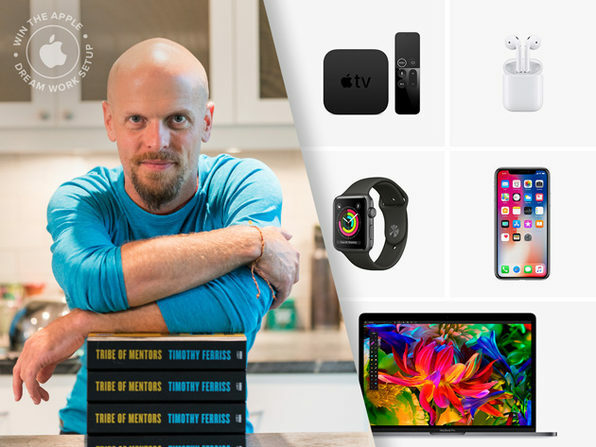 In honor of the release of #1 New York Times best-selling author Tim Ferriss's new book release, we're feeling extra generous and packaging together some incredible gear and gadget bundles for three lucky winners! Tim is one of the world's greatest productivity gurus, and in his years of helping people reach their true potential he's connected with and gleaned the secrets of some of the worlds most productive and successful people. Enter to win this giveaway and you could walk away with one of the most incredible bundles of Apple tech ever assembled, or one of two awesome collections of gear and gadgets picked by members of Tim's Tribe of Mentors. Yep, that's three (3!) chances to win, so go ahead and enter now for free, and don't forget to pick up your copy of The Tribe of Mentors: Short Life Advice from the Best in the World on Amazon today! Is any introduction really necessary here? Win this giveaway, and you're bringing home a complete set of Apple's flagship products. An entire tech makeover is just an entry away! Sourced from some of the most successful, productive people in the world, each of these products was named by a Mentor as an extremely impactful purchase in their life. You want to be the best, you need to shop like the best, right? Well, we're taking care of the shopping part for you so you can go ahead just being the best. From apparel and tools to help you wake up in the morning, to reusable shopping bags, this tool kit stresses the importance of doing the simple things consistently well. Chosen by luminaries in their fields, each of these products is sure to give you a productivity boost! Enter sweepstakes and receive exclusive updates and offers via email from Tim Ferriss and StackSocial. Unsubscribe anytime. Apple is not affiliated with this contest. This promotion is in no way sponsored, endorsed or administered by, or associated with, Facebook. You are providing your information to StackCommerce, Inc. and not to Facebook. 1. Eligibility. Subject to the additional restrictions below, the StackCommerce The Tim Ferriss Tribe of Mentors Dream Setup Giveaway Sweepstakes (“Sweepstakes”) is open to all humans age 21 or older at time of entry. Residents of Taiwan, South Korea, Portugal, Italy, Austria, China, Russia, Hong Kong, Greece, France, Japan, Spain, and Czech Republic are not eligible to enter or win. For purposes of these Official Rules, all times are Pacific Standard Time (PST). Employees or agents of StackCommerce, Inc. (“StackCommerce”) and co-sponsors of the Sweepstakes (if any) and their respective affiliates, subsidiaries, advertising/promotional agencies, and the members of their immediate families (i.e. parents, children, siblings or spouse) or those persons living in the same household of such individuals are ineligible to enter or win. The Sweepstakes is subject to all applicable federal, state and local laws and regulations. Void where prohibited by law. Participation constitutes entrant’s full and unconditional agreement to these Official Rules, any terms that apply to your use of Facebook’s policies and procedures (to the extent you seek Additional Entry per below) and any other terms that apply to your use of Facebook and Sponsor’s decisions, which are final and binding in all matters related to the Sweepstakes. Winning a prize is contingent upon fulfilling the eligibility requirements set forth above and below. 3. Sweepstakes Term. The Sweepstakes will end at 11:59 PM PST on 01/31/18 (the “Sweepstakes Term”). Sponsor’s computer is the official time keeping device for the Sweepstakes. 5. Prizes & Approximate Retail Value. A total of $4,511 prizes will be awarded to winners selected at random. One Grand Prize is available, to be given away. The Grand Prize consists of: a Macbook Pro with an approximate retail value (“ARV”) of $1300.00, an iPhone X with an ARV of $1000.00, Apple AirPods with an ARV of $150.00, Apple Watch 3 with an ARV of $400.00, and an Apple TV 4K with an ARV of $200.00. The Second Place winner shall receive: a Manduka Pro Black Yoga Mat with an ARV of $90, a Weight Blanket by Weight Idea with an ARV of $182, an Apple Pencil with an ARV of $99, Beats Solo3 Wireless Beats with an ARV of $299.95, The HeartMath Inner Balance with an ARV of $119.25, Hearos Xtreme Protection NRR 33 earplugs with an ARV of $13.67, Native Union iPhone Charging Cable and Tata Harper Be True Lip Treatment with an ARV of $69, and an Extended Battery Case iPhone X with an ARV of $39.99. The Third Place winner shall receive an Under Armour SC30 ICDAT Men’s Basketball Short Sleeve Shirt with an ARV of $34.99, a Phillips Wake-Up Light with Colored Sunrise Simulation with an ARV of $117, a MacBook SleeveCase by WaterField Designs with an ARV of $69, The Five Minute Journal with an ARV of $22.95, Apple AirPods with an ARV of $143.99, an Incase City Collection Compact Backpack with an ARV of $70, and a 4-pack of Tile Mate key finders with an ARV of $69.99. StackCommerce’s decisions as to the administration and operation of the Sweepstakes and the selection of the potential winner are final and binding in all matters related to the Sweepstakes. The potential winner will be notified immediately via email or through Facebook. The award of prizes exceeding a retail value of $600 is subject to applicable withholding requirements and the winner will receive an IRS Form 1099 reflecting the actual final retail value of the prize. Where permitted by law, the potential winner will be required to sign and return to Sponsor(s), within seven (7) business days of the date the notice is sent, an affidavit of eligibility and liability/publicity in order to claim their prize. If a potential winner cannot be contacted or fails to sign and return the affidavit of eligibility and liability/publicity release within the required time period, the potential winner forfeits the prize, unless prohibited by law. Receipt of a prize by a potential winner is contingent upon fulfilling all requirements described herein. The winners must continue to comply with all terms and conditions of these Official Rules after prize notification. In the event that a potential winner is disqualified for any reason, StackCommerce will award the applicable prize to an alternate winner by random drawing held by Sponsor from among all remaining eligible entries received during the Sweepstakes Term. Prizes may not be transferred or assigned except with Sponsor’s written consent. 14. Winner List. For a copy of the name of the winner(s), available after 11:59 PM PST on 01/31/18 + 1 month, 2016, or a copy of these Official Rules, send a self-addressed, stamped envelope to, StackCommerce, Inc., Attn: “Winner List/Official Rules” for The Tim Ferriss Tribe of Mentors Dream Setup Giveaway 21 Market Street, Los Angeles, California 90291.